1. Measure your body and weigh in. 2. Become aware of how many calories you eat each day–without any changes. What was your average caloric intake for the days you counted? Were you surprised by the calories? Have you set a realistic goal that you’re going to work towards? What was the hardest part of doing these tasks? Now, onto the exciting Thursday night I had…I was craving sushi (what else is new?) and Michael suggested Bamboo. We discussed building in a “restaurant” night in our Meal Planning for Thursday nights. It would be a nice change from cooking. Thursday nights are usually less crowded than weekends. Plus it doesn’t have to be a fancy restaurant experience–it could often be Subway or a burrito that costs $5. I agreed and said that I probably didn’t want to do it every Thursday night but a few times a month worked for me. It’s one of my favorite sushi places in Portland. 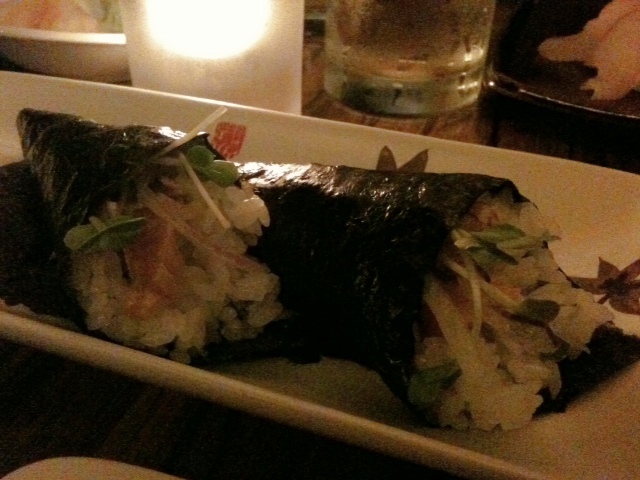 Masu would be the first–upscale, expensive, in the trendy Pearl District. 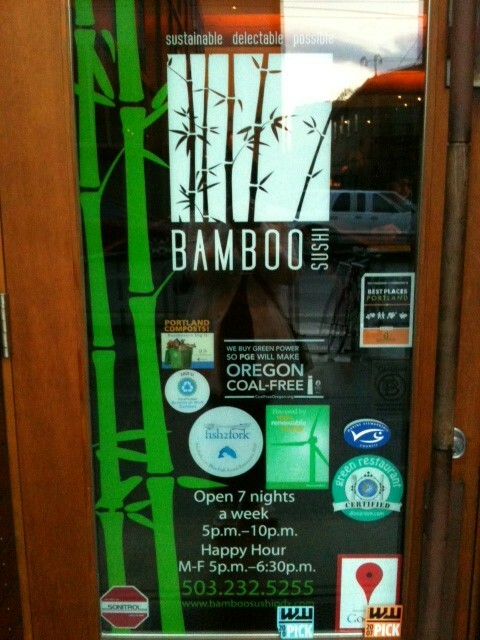 Bamboo is on the same level as Masu, just a little cheaper and not downtown. There’s always a line it seems but last night we slipped in just in time to enjoy Happy Hour prices. 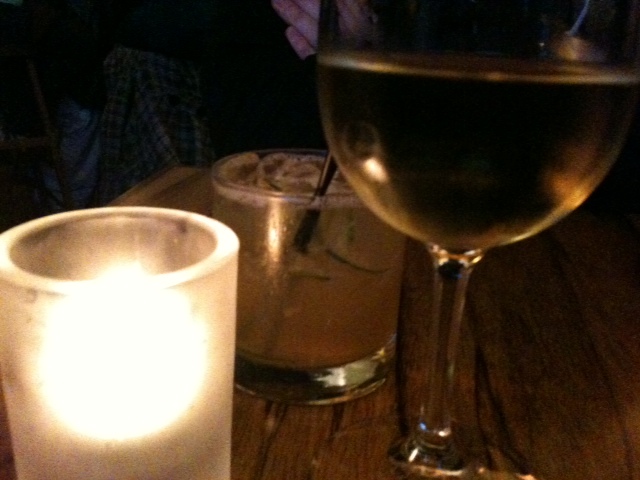 I enjoyed one glass of dry reisling wine and Michael had one of his favorite whiskey drinks at Bamboo. I was famished. 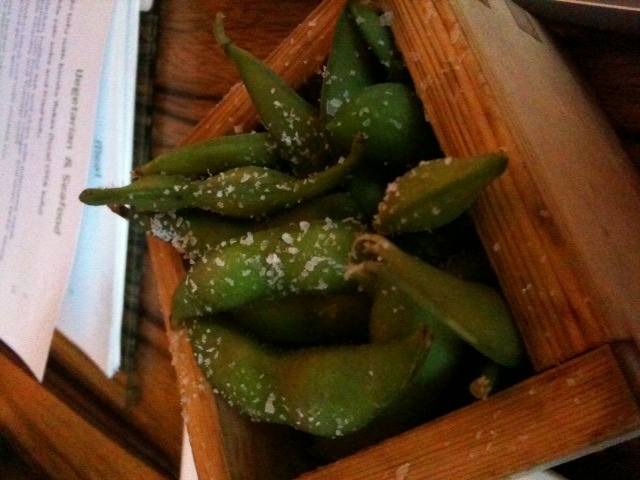 I think I ate most of the edamame. We split the specialty roll of the day: some sort of albacore with rice and cilantro wrapped in seaweed like an ice cream cone. It was surprisingly amazing. I wished we’d ordered two! 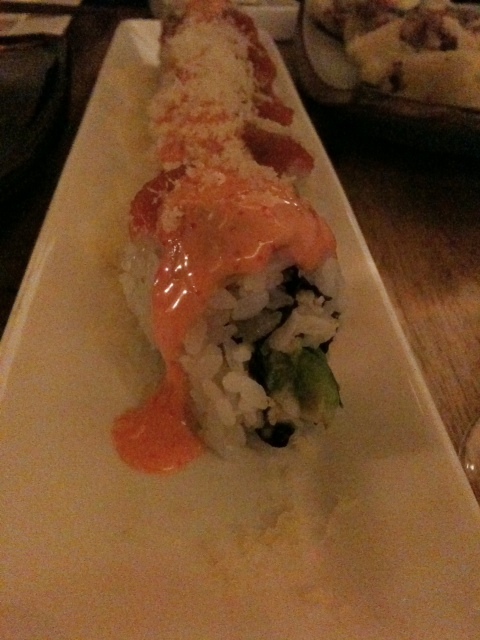 I ordered the “California Sunset” specialty roll (my favorite of theirs) with spicy tuna, spicy mayo and tempura crunchies. Delish. I also ordered one Philly Roll. We shared the sushi. I wanted to order another roll (and eat it all) but I resisted. Splitting two rolls was plenty in addition to the other food we got. Michael ordered the steak and the special Nigiri of the day: black sea bass. He said it was really good but I didn’t try it. Not cool, man. Not something I wanted to deal with either. 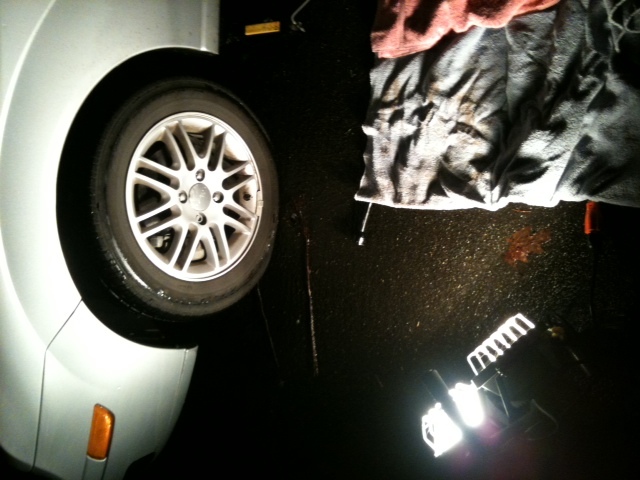 Luckily my selfless, Knight in Shining Armor changed it to the spare tire despite the cold, dark, rainy night. He didn’t complain or get grouchy (I totally would have) and his back hurt too. Thanks sweetie! I’ve changed a flat tire once in my life–and it took me about 2 hours. 🙂 Les Schwab was awesome. Best customer service I’ve had. They fixed it for, rotated my tires and I was out of there and on my way to work in 30 minutes. I had great customer service at Bamboo and Les Schwab. Love it! QUESTION: Can you fix a flat tire? Nope, can’t fix a flat. Chris got one on the 520 bridge (but was able to pull over and not block traffic) in the snow but he called AAA and then waited. I was super psyched to be down a pound this week (2 week loss since I decided to keep my cold germs at home last week), especially after I’d had an episode with some homemade sourdough bread this week. I *still* need to add in exercise, and I may do some vegetarian/vegan experimenting this week while my WeightWatcher budding is hiking in the Grand Canyon. To anyone who wants to lose weight: slow and steady, learn from your stumbles and move on. Every day is a new day to fuel your body. Yikes–the 520 bridge is scary. Luckily I’ve been home both times I’ve realized I had a flat tire, so that’s been good. Congrats on being so close to goal weight! Your loss this week should be really encouraging, especially with limited exercise. I bet when you’re feeling better and can exercise those that few pounds will melt off. I’m disappointed with Heavy too and won’t be watching it anymore. What a bummer! I have read your blog and have been hesitant to look at this for some reason. Since my kids will be home this weekend I think I will attempt to write down everything I eat on Monday and go for there. I have lost a lot of weight but it is beginning to creep up and it freaks me out. That’s okay Kathi. Not everyone is “ready.” I wasn’t ready for a long time. I just lived in denial. I said “I’m not that big.” And made excuses. There’s nothing that can be done successfully until we’re truly ready to face it and do the hard work. It sounds like you’re thinking about it. That’s a good step! What a great idea! I will post about it on my blog as well! I just found your blog today and am totally inspired. I’ve lost over 100 lbs. too. Looking forward to more entries! Congratulations on losing 100 pounds Laura! I’ll check out your blog now. I love the steps. they can be the hardest things to get over. Sure, there are a milllion choices to make, but you have to un-stick the moss covered ball before you can get it rolling. Have you ever tried Mio sushi on NW 23rd? Pretty darn good! Hey Nikki! What was your old blog named? I used to follow it and didn’t realize you changed. As for the steps–the hardest part for people seems to be WHERE and HOW to start. I hope that this gets them to a starting point. I’ve been to Mio in Sellwood and on Hawthorne. I have not tried the one in NW yet. I love that you are helping with the Where and the How. VERY important, and to have someone motivating you can be so helpful! My old blog was ready2beme. I decided to focus more on what is quickly becoming a passion – running! Congrats on running! That’s great! This is an awesome post. Just found your blog, and so far, I love it. I will definitely keep reading. Yes, I can fix a flat, only done it twice though. The first time was scary, scary! I was with a girlfriend of mine and we walked out her house to head to walmart and noticed her tire, F-LAT. Flat as could be. She didn’t know how to change it, and I had never done it before. 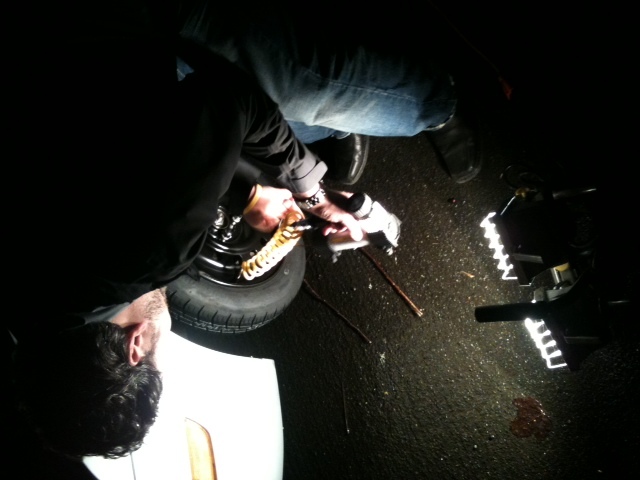 But I had watched my boyfriend change my tires enough times (I am the QUEEN of flats) to know how it’s done. So, I hopped in and we changed the tire. I felt very good about myself that day! That’s awesome that you were able to save the day for your friend!